A homily preached at a Service of Lessons and Carols for the Order of St. John of Jerusalem, December 7, 2014. Yesterday was the feast day for Saint Nicholas of Myra. And yes, this is the Nicholas who was the fourth century bishop whose life has morphed (for better or for worse) into modern conceptions of Saint Nick and Santa Claus. Though little is known about the actual Nicholas, one of the most famous stories told of him has to do with a family who had three daughters. As the young women grew up, it became known to Nicholas that the family had no money for dowries for the women to be properly married. The only options for them seemed to be abject poverty or prostitution. But Nicholas saved them from that predicament. He saved them by throwing a bag of gold through their window, anonymously. Some sources say he threw it into the chimney, and you can see where that has led in modern legends. But the point is that they didn’t know who had done this kindness for them. But it changes their lives. It made things better. And I bet it encouraged a mentality of generosity in those young women and all who knew them. I wonder what we can do to encourage a culture of anonymous generosity. What would it be like if we were able to do things for other people without always looking for recognition or credit? Some of you may not be familiar with the Order of St. John of Jerusalem. 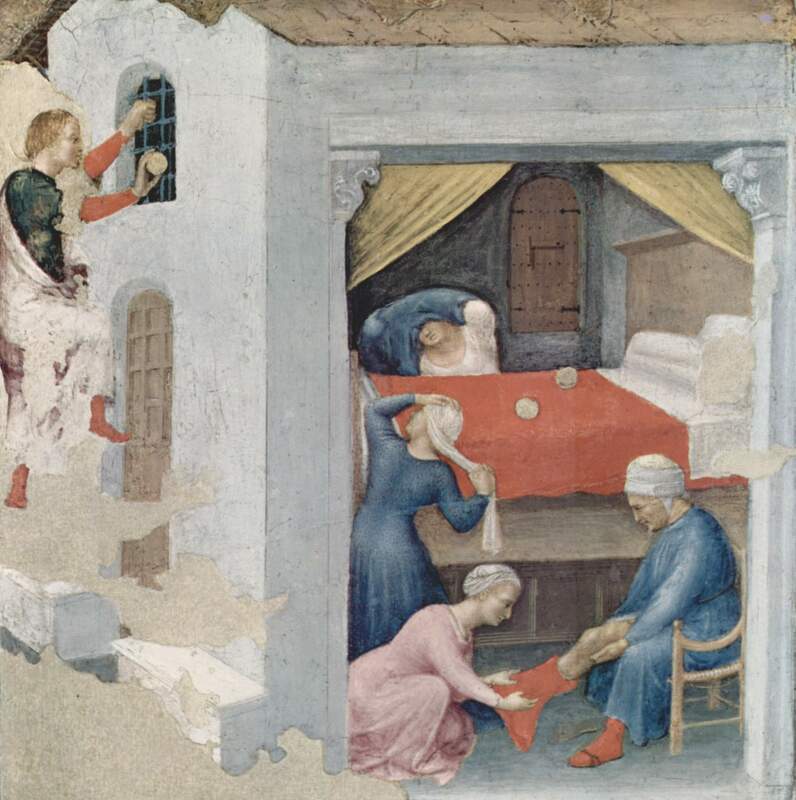 We trace our lineage way back to the Knights Hospitallers who were among the first to provide care for poor, sick or injured pilgrims to the Holy Land. Today, the American Priory of the Order focuses much of its energy on supporting the St. John Eye Hospital in East Jerusalem, with clinics in the West Bank and Gaza. The rate of blindness in the occupied Palestinian territories is ten times higher than in the West and over a third of the population lack food security. The hospital group treats patients regardless of ethnicity, religion or ability to pay. Much of the generosity that supports the work of the Order of St. John is hidden, quiet, and anonymous. Sometimes we dress up at bit and we do sign our names on a check or two, but throughout the Order of St. John, much is done in secret. And that’s a good thing, whether we are simply being humble, giving a nod to the true spirit of St. Nick, or perhaps even following our Lord Jesus Christ who said, “when you give alms, do not let your left hand know what your right hand is doing, 4so that your alms may be done in secret; and your Father who sees in secret will reward you” (Matthew 6:3). What if, at Christmas, people got excited about following the REAL Saint Nicholas? What would it look like for us to go out of our way to remain hidden, but give to someone who is needy? What might it look like if we were to incorporate a bit of that spirit into our charity, into our stewardship, and into our holiday gift-giving? Especially in this season, may we be gracious in our giving and in our receiving, that our hearts might be prepared to receive more fully the gift of God, Jesus Christ who has come in the flesh to be like us, to be among us, to be with us, to be for us.